This last summer I met a wonderful lady who has two grown children with special needs. And for some reason when I meet someone like that, I can't explain it but it feels like "home." After telling me a little about her kids (both with unique needs even in their adulthood) she asked about Lucy. We hardly knew each other but my eyes welled up as I explained how wonderful her friends and support group are. Then I spilled out how worried I am about those sweet friends because I never want them to feel a burden of always looking out for Lucy. She looked right in my eyes and said, "Don't you ever feel bad about those who reach out. It will change their lives in wonderful ways." Then she proceeded to tell me how several of those kids who reached out to her children have grown up and come back to thank her for letting them be part of her children's lives. And for some reason that thought was so soothing to me. I know there are some not-so-magical parts of reaching out to Lucy. She can be moody and dramatic and stubborn, and when she's in a chatty mood it's tough to get a word in edgewise. But that little chat made me realize it's ok. Because there are so many good things that balance it out, at least for those who are willing to stick around. And quite honestly it makes me tear up every single time I think about it. Lucy is one lucky girl. She's surrounded by a village of goodness on all sides. Which brings me to last week when her Braille teacher and I got to visit all those cute fifth graders in her class and explain what in Heaven's name BBS is. Because part of being a "village" sometimes takes some insight. 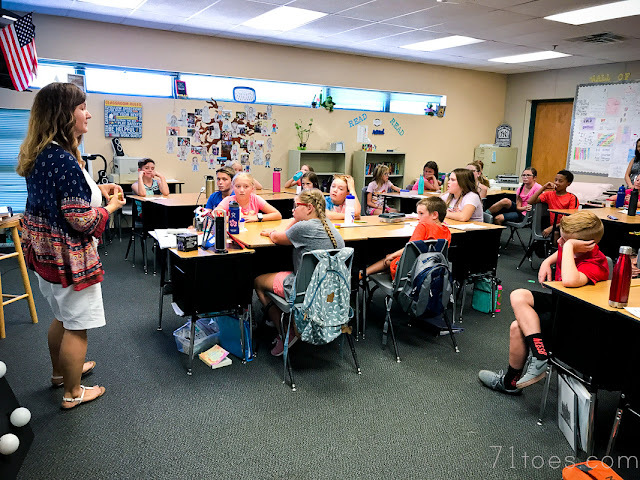 Last year some different factors came up and some questions arose in Lucy's class of 4th graders as to why Lucy's eye was shaking and why did she get a different computer and always get to sit in the front of the classroom. I told one of the cute kids asking during art masterpiece one day that I should come in and explain what's going on with the whole class. He was all over that idea, and Lucy was ready, so we went in and did a lot of explaining. I wrote lots more about that HERE. It was a pretty great experience. At the end of the year her 4th grade teacher recommended we do something similar at the beginning of this year so that everyone can know what's going on from the get-go. And sure enough, that first week of school Lucy asked if I could go ahead and schedule that little meeting. So I did. And it went pretty great. I was super nervous going in this time. I don't know why. I guess I just want so much to explain things in the right way and rally that little village of goodness in that class to understand from their hearts. 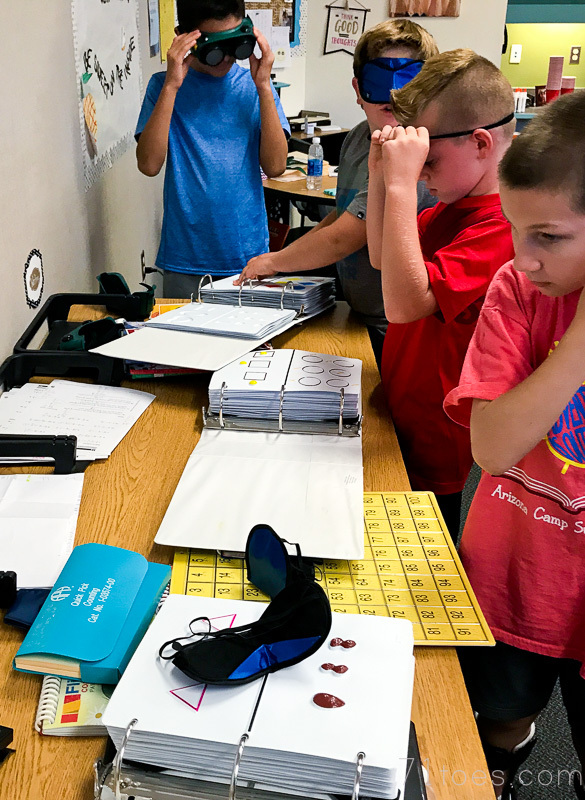 This time Ms. Wells, her awesome Braille teacher, took the lead, and seriously, that woman is pure gold I tell you! She explained all about vision loss and how it works and also explained all the "stations" the kids were going to get to do. Then I got to talk about BBS specifically. I loved it because when I explained that even though Lucy is losing her vision, her other senses are helping her in so many extra ways, this one cute boy in front said, "it's kind of like she has superpowers!" And when I was done he was darling and said, "I think I'm kind of jealous!" 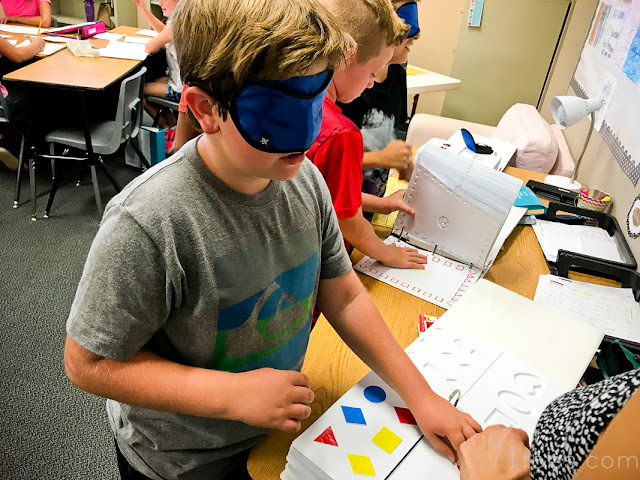 They used blindfolds and also special goggles and try to decipher different things they were feeling in the books that Ms. Wells brought. See those goggles up there above? Each pair assimilate a different kind of vision loss. The kids were so polite and respectful and I sure hope that little experience will help them be willing to speak up and ask questions if they have them to understand vision loss a little better. Because whether they are part of Lucy's village now, or in villages of future family members and friends who need them, they can make a difference. 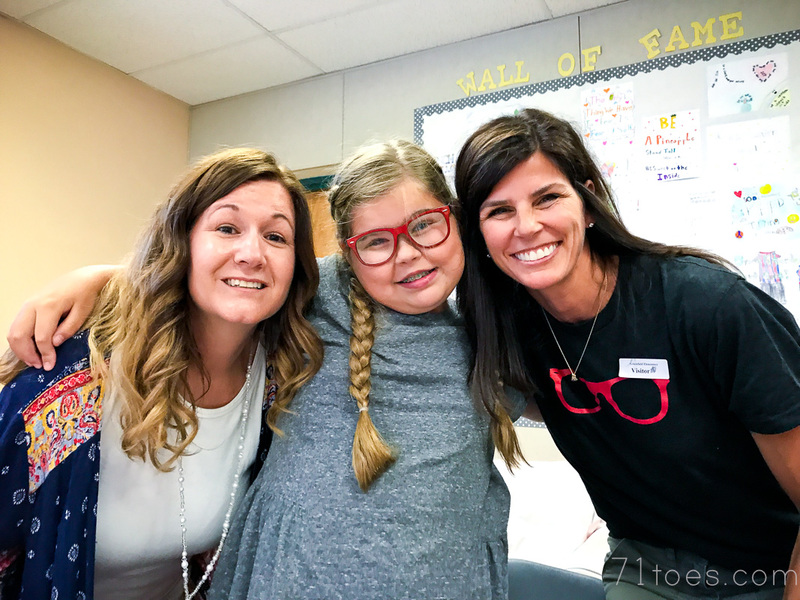 I'm so grateful I get to be part of Lucy's village...and that she has this amazing Ms. Wells and all the class teachers and kids through the years who are patient and full of love for her. Because that love makes all the difference. I love this so much!! I love that the kids got to experience the "stations" and different things Lucy does. It kind of put her on a pedestal to those kids...which is so awesome for her!! That is such a great way to rally support/understanding for her!! They are Provenza Old World Fossil Stone. I wish I could! And that I could keep her around here too. She's an awesome lady! Love this! I was talking to my dad (a physical therapist for children with special needs) about how you love hiking and it's getting hard for Lucy and he had a great idea. A few years ago, he helped a boy who is blind go on the high adventure scout hiking trips by taking two strong poles (you could use curtain rods, wood, really anything) and then you and Dave would stand in front of and behind Lucy holding the two poles on either side of your body. Lucy would stand in the middle and be holding on to the poles with both hands. In this way, she can feel when you step up, down, to the side, etc, but is independent in her hiking as she is just holding on to the poles for guidance and balance, and to catch herself should she trip. This would also work in situations you may not be able to go (for this boy on the scout trips, the other boys in his troop held the poles and thought it was awesome.) Anyway, you may already have tried something like this, but I thought I'd pass it along in case it might help. I love reading your blog, it gives me courage in my own motherhood! Thank you! This made me smile to think of someone reaching out to help an internet friend. Love this idea! Thank you so much Becca! We'll definitely have to try that! Shawni, you seem super motivated. 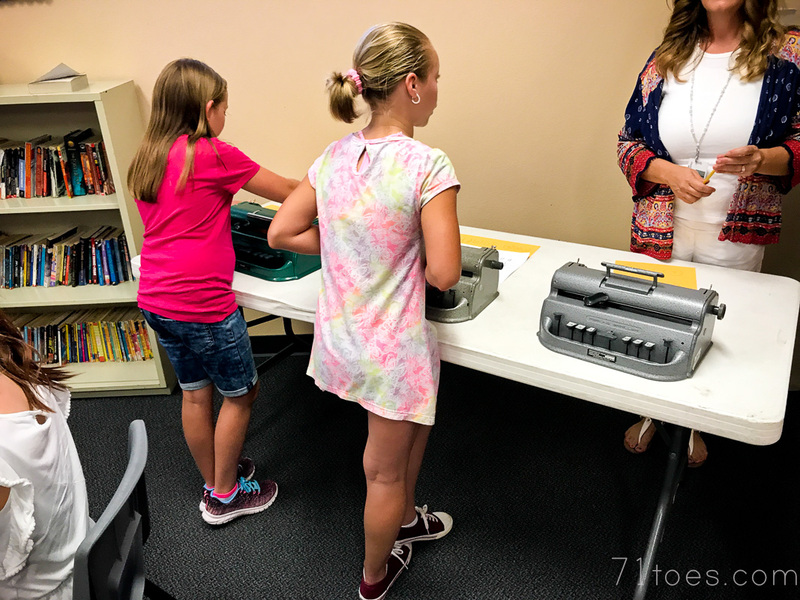 Have you considered learning Braille yourself? Another friend wrote the book, Just Enough to Know Better, by National Braille Press. Another option is to do it online for free at www.uebonline.org. 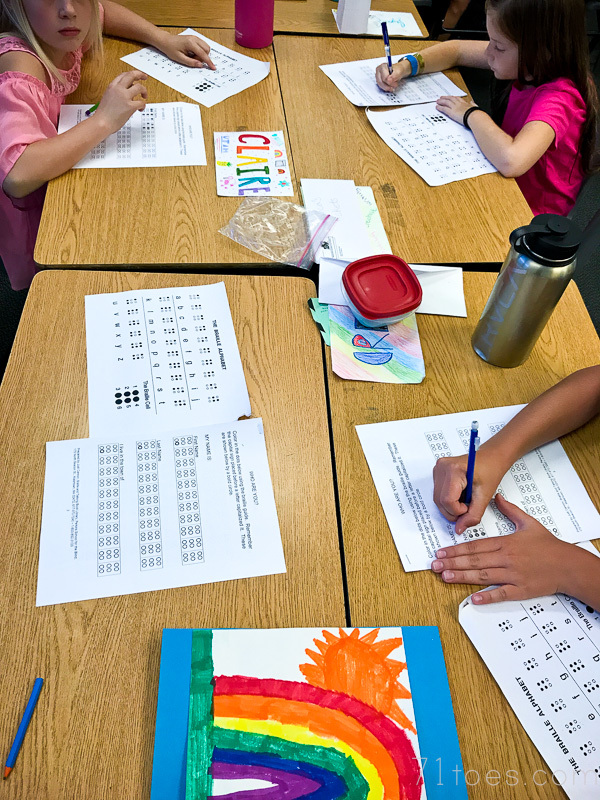 You can learn to read and write UEB (unified English Braille) at this site. Thank you so much for these links and ideas! I'm going to have our whole family watch those videos for Family Night. And I love the idea to celebrate January 4th! And I think learning Braille would be pretty great. I've learned quite a bit through Lucy, but it would be pretty great to study and learn more. Thank you for the information about that as well. I really, really appreciate all these great thoughts suggestions! Shawni, I love your blog. With all the horrible-ness going on in the world, I just want to yell at the top of my lungs, "Love matters!! Kindness matters!!" Thanks so much for nurturing that feeling here on your blog and in your community. And thanks to the other commenters for being so kind and thoughtful as well! I don't comment, but I read often. I love the part about what a gift Lucy will be to so many by the service and love they share with her. Such a great thought to ease your worries of being a burden. I thought I would share a website that you may want to explore. Somebody above mentioned Eric weyhnheimer - it's his organization called "no barriers"! I am in Colorado and he lives in the neighboring suburb. He's pretty incredible. Last year, I took our young women to hike a 14,000 ft. Peak and he was climbing it with 3 guides and another bling young man. He was training him to hike Kilimanjaro. So inspiring. Thanks for sharing your goodness through your blog! That is very inspiring. Thanks for the added insight! Long time reader, first time commenter. Just wanted to thank you for sharing your daughter's experiences with BBS. 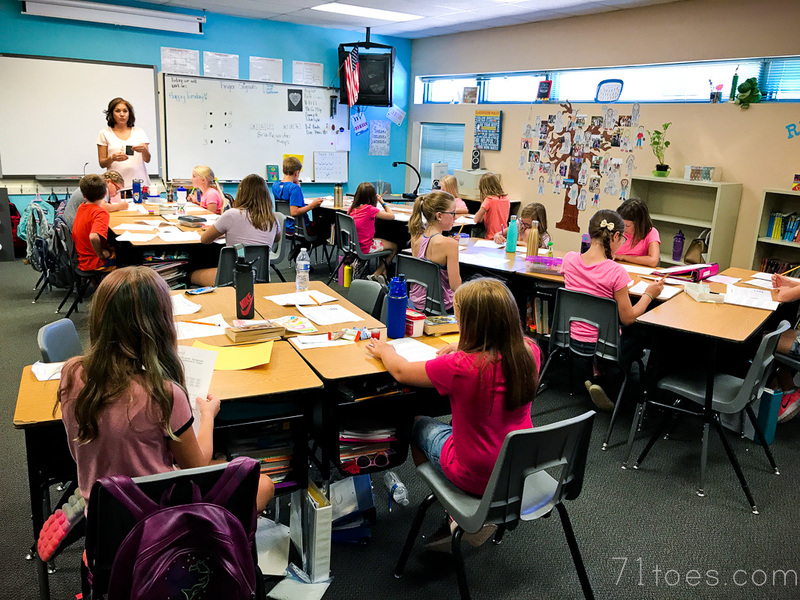 I am a middle school teacher in San Diego and have a student with BBS this year. Because of your blog, I feel a little more educated and prepared to accommodate her needs. This makes me so happy. I'm sure she appreciates you more than you know! This literally made me tear up (my baby is 6 months, and I am still soooo emotional!). You are such a sweet mom, thanks for sharing! Lucy is such a lucky girl to have you. i homeschool- but this is so cool... can i get information so maybe i can have this happen at my home? Hey Holly! I'm not sure how to send information because these people live here, but I bet you could google vision educators in your area? Also, you could incorporate some of the things Annie linked, I'm so excited to share them with my kids! What an incredible and tender advocate that Lucy has in her mother. This truly inspires me.